I ventured out into Nairobi this weekend…took a leap into the deep end. One thing I did do was purchase a cheaper watch that isn’t so desirable. 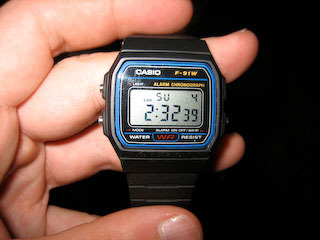 I settled upon the beauty in the picture…a 1980’s Casio…nice. Talked him down from 3000/- to 500/-…which apparenlty was still a rip off. I can’t wait to show it off to all my friends. Work starts tomorrow so I’m gonna get a good nights sleep and catch up with you soon.